Enjoy Cardini's Garlic. 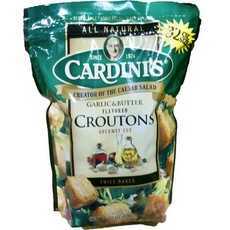 Cardini's Garlic Gourmet Cut Croutons Are Packed Full Of Garlic Flavor And Have Extra Crunch. (Note: Description is informational only. Please refer to ingredients label on product prior to use and address any health questions to your Health Professional prior to use.